Are you looking for SSC MTS Exam new syllabus, Exam Pattern 2017-18? Then here is the best place for you. SSC MTS Exam new syllabus, Exam pattern 2017 and Exam preparation tips pdf file provided here. Every year, SSC MTS Exam is the most important for the job candidates. Most of the students waiting for this Examination. So, for you better preparation you should know about particular exam syllabus and pattern. 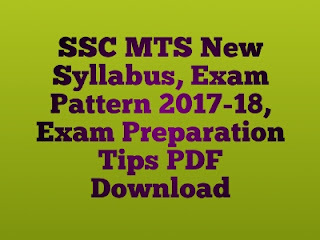 Today GK Solve Share SSC MTS Exam new syllabus, exam pattern 2017-18, and Exam preparation tips pdf file with you. you can download this pdf file just one a click and free of cost.Hope, this pdf file is helpful to you. If you help from the blog, please share the blog link with your friends.